A £5.7M project to build new A1 Housing homes is now well underway on Smith Square in Harworth. 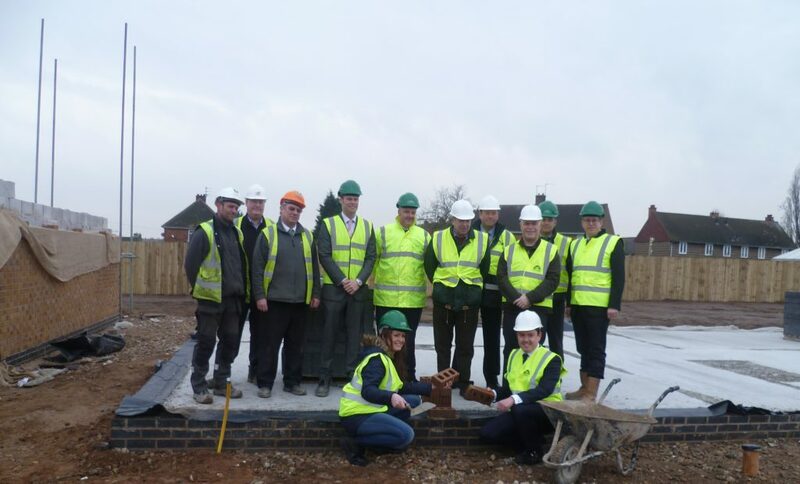 To celebrate Bassetlaw District Council, A1 Housing and construction company Robert Woodhead joined forces to mark one of the first bricks being laid by A1 Housing tenant Shelley McVay. The project is benefiting from £1.02M worth of Government funding from the Homes and Communities Agency and will be completed in three phases. ■ Phase One – Numbers 17 and 18 on Smith Square have already been demolished to allow access to the former playing field where 19 properties are now under construction. ■ Phase Two – Tenants living on Smith Square will move into the new homes and the remaining eight ‘Airey’ houses will be demolished to make way for 24 new properties. ■ Phase Three – Tenants living on Thompson Avenue, Common Lane and Styrrup Road, will move into the new properties on Smith Square and the existing ‘Airey’ houses on Thompson Avenue will be demolished. A1 Housing’s Don Spittlehouse, director for technical and housing, said: “We’re delighted that Shelley could be involved in the process and lay a brick in one of the first properties on site. All the new homes are being designed to exceed the current basic building regulations and energy efficiency standards and are likely to feature energy saving measures such as solar panels, providing tenants with lower energy bills. Woodhead were selected following an extensive tender process which was conducted with the assistance of regional procurement consortium Efficiency East Midlands. Cllr Alan Chambers, Cabinet Member for Housing, said: “This is a fantastic project that will replace the outdated Airey Houses and, as an authority, allow us to build new homes for a new generation. Glenn Slater, business development director at Robert Woodhead added: “Working on a project like Smith Square where we are building a range of modern, energy efficient flats, family houses and bungalows, gives us the opportunity to have a wider community impact.